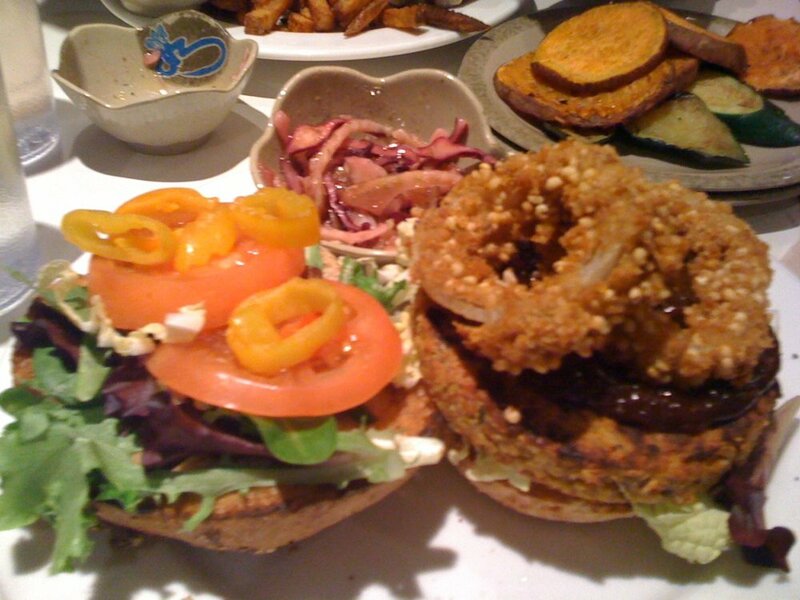 Fresh is one of my favourite restaurants to take people who are hesitant to try vegan food. There is such a wide variety of modern American-style food that surely the most finicky eater can find something that appeals to their taste buds. 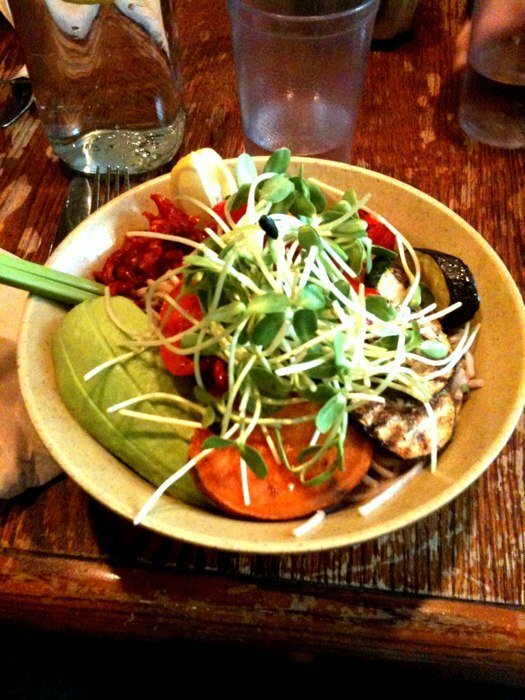 From tofu burgers, wraps, rice bowls, appetizers… Just to name a few. 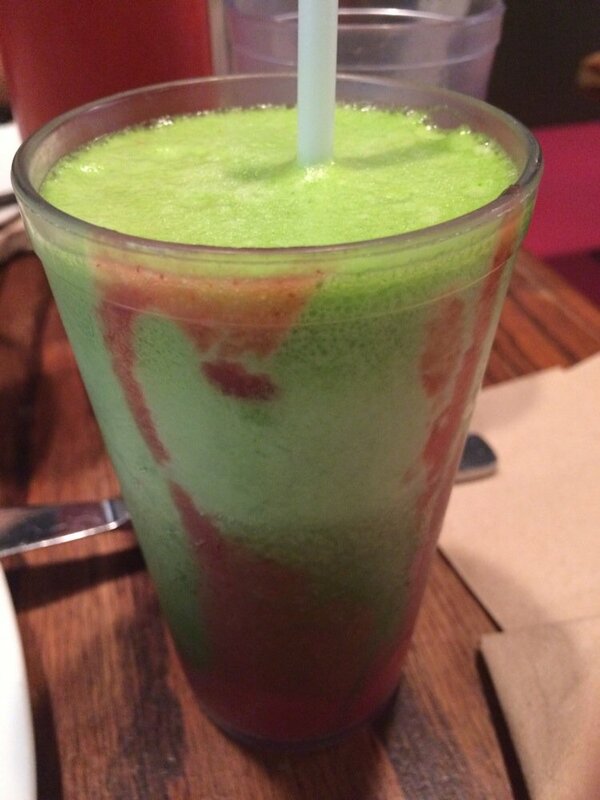 They’re also known for their juice bar with an endless list of juices. Don’t believe me? Go at anytime during peak meal hours and you’ll be waiting anywhere from 30 minutes to an hour for a table. Fresh is part of a chain with four locations in Toronto: Bloor and Spadina, Queen and Spadina, Trinity Bellwoods and Yonge and Eglinton (newest location). What I particularly enjoy is their brunch menu. 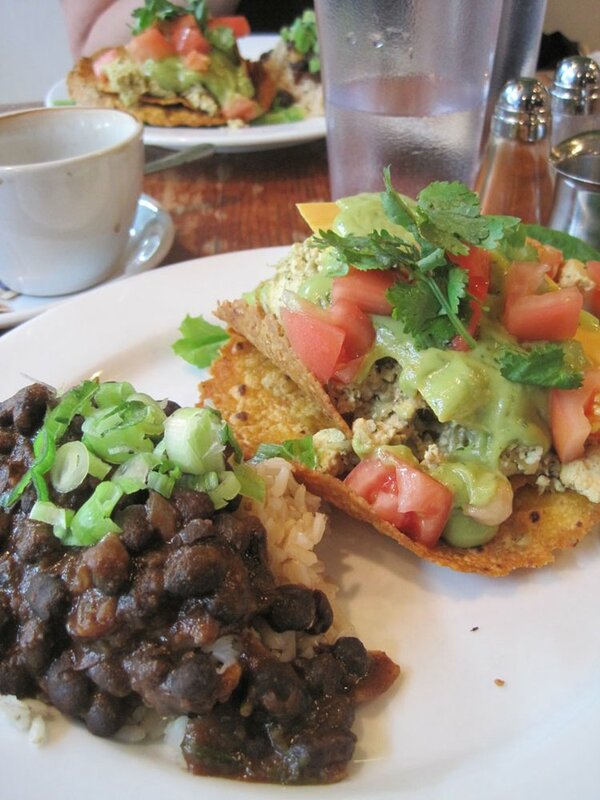 Given that a typical brunch consists of bacon and eggs, it’s always a challenge trying to take a vegan to brunch. The brunch menu at Fresh is served on the weekends (and holidays) between 10am-3pm. And they do offer dairy alternatives to most dishes. So yay (for those too afraid to try a fully vegan breakfast)! The entree brunch menu starts at $13 and there is a choice of a pancake platter, full breakfast, brunch burrito or tex mex tortilla scramble. 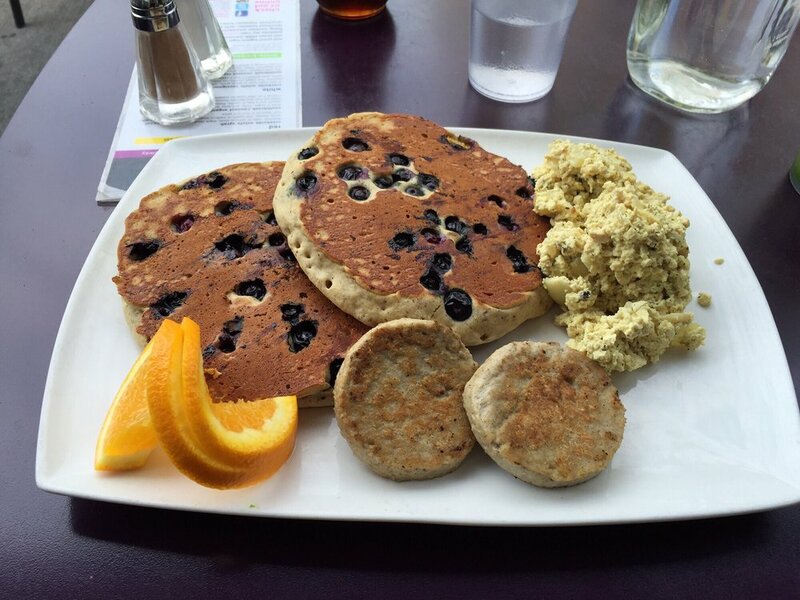 My favorite dish is the pancake platter, which comes with two thick and fluffy pancakes (gluten free, of course), scrambled tofu, and a choice of vegan sausage or tempeh bacon. You do have a few choices for the pancakes, from bananas to blueberries to almonds and other nuts to combo of the above; they’re all really good with plenty of fruits and nuts (depending on your choice) inside. I know the idea of scrambled tofu might not sound appealing but they do a good job making it quite flavorful and seasoned. I’ve also tried the brunch burrito: scrambled tofu lettuce, alfalfa sprouts, grated carrot, tomato & fresh ‘cheese’ sauce; and the tex mex tortilla scramble: crispy corn tortillas, brown basmati rice and spicy black beans, with scrambled tofu, avocado, cilantro, tomato, lettuce, green, onion, Valentina hot sauce & fresh ‘cheese’ sauce. The tex mex is definitely the more flavorful of the two and quite spicy (for my liking, but as mentioned, I am quite a wuss when it comes to spice). And you can substitute the “cheese” sauce with real cheese. 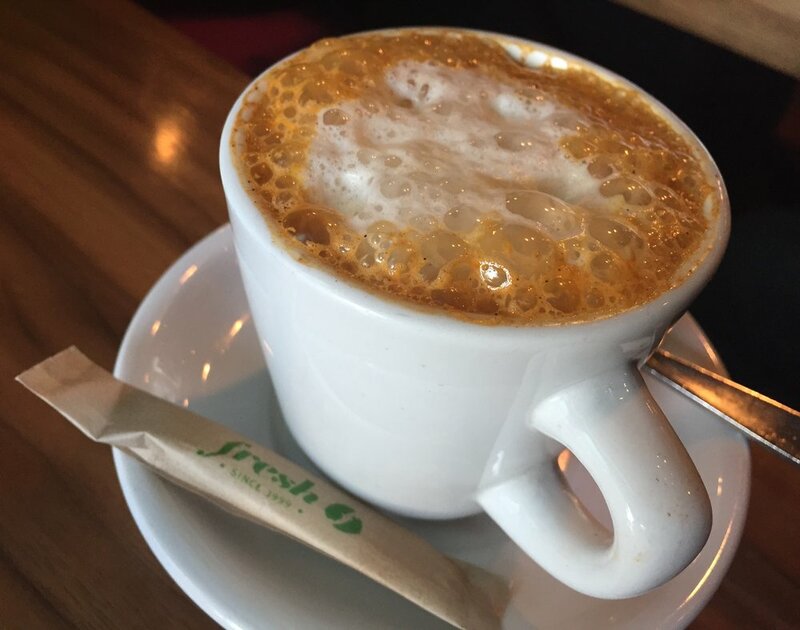 And if java is part your breakfast routine, they do serve espresso, americanos, lattes and cappuccinos (prices range from $3-$5). And yes, there are tea options for our non-coffee lovers (freaks!). And yes, you can get real milk. The espresso beans are a local organic brand (I believe Dark Horse). It’s quite flavorful and rich. So, if you’ve ever been curious to try vegan food, I highly recommend Fresh. You really can’t go wrong. Fresh is terrific. I haven’t been awhile. This sounds like motivation to return!